Houses & Homes VA: An Amazing Kitchen Remodel for Under $500! An Amazing Kitchen Remodel for Under $500! The kitchen is and always has been the heart of the home. It’s the room that we “hang out” in. It’s where we talk together as a family, share the day’s events and catch up on the latest news. Most importantly the kitchen is where we make that big turkey on Thanksgiving, or that unforgettable Xmas ham. It’s no wonder at all that so many homeowners would love to remodel their kitchen but this is one home improvement that does not come cheap. Even the most basic kitchen renovation can cost $20,000 or more and that’s simply not in everybody’s budget. What if you could transform your kitchen for under $500? Impossible you say? Not at all! A big part of your kitchen’s appearance depends on the countertops and cabinets, right? Well, thanks to the miracle of modern science there is a way to completely recoat those items for a brand new kitchen that looks as if you have spent thousands! Your first step is to decide on your new color scheme. I suggest that you choose what exciting new color you would like your cabinets to be. This will make the rest of changes a lot simpler. I don’t usually like to recommend a particular manufacturer or brand but I will make an exception this time. Rust-Oleum now offers a new product called Cabinet Transformations that will give your cabinets the appearance of having been handcrafted with very little labor. There’s no need to strip, sand or prime and it will work on any type of cabinet, wood, laminate, whatever. The best part is that you can choose from dozens of finishes to get that exact look that you want for your kitchen. The average cost is usually around $150 and the results are stunning! This product is more amazing than the first and you will NOT believe the results! You can completely transform your current laminate countertop to look like an authentic natural stone such as granite or some other popular finish. You can do this yourself in a weekend and it will only cost about $250! Again Rust-Oleum is the maker of Countertop Transformations. There may be similar products by other manufacturers that work just as well but this is the one that I’ve just discovered. You might ask your local expert about similar products on the market. Now that your kitchen has a complete new look it’s time to complete the transformation. For a very small investment why not replace those outdated cabinet knobs and door pulls with some new ones? There is a huge selection of them at your nearest home improvement store and you can match them to your new counter and cabinets. There you have it! A very “expensive” kitchen remodel fur less than $500! 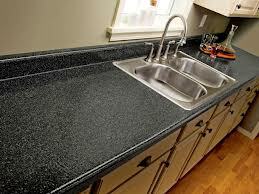 And yes, the picture is an actual countertop that was done using this product.